I Love 2 Teach is hosting a linky party on classroom tips that make teaching just a little easier. I am looking forward to seeing all of the ideas people share. 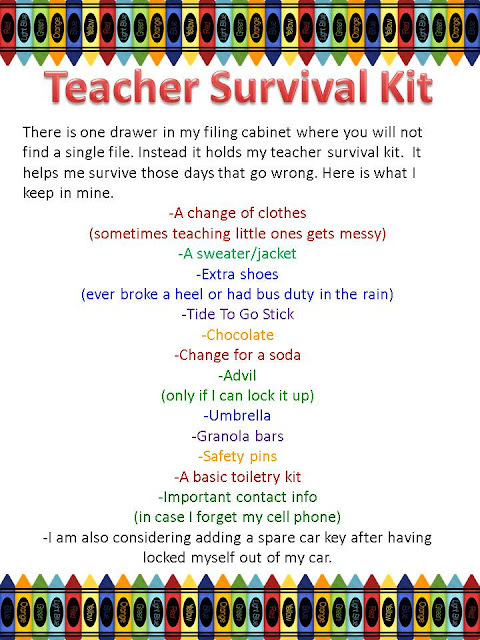 I wanted to share my Teacher Survival Kit. Having one has made my day go a lot smoother more than once. Don't forget to follow this blog and my TPT store to pick out a free product. You can go here to participate. This closes at 9PM EST on Friday July 23rd. I'll send all of the products this weekend. Now Closed. Thanks. I need this kit! You're a genius! Thanks. Most of the items got added after I needed them once. I love this! And as a kinder teacher... an extra change of clothes is a must! Funny you mention a key. I lost my keys this year and never found them, even after I packed up and am moving to another district. My husband was so mad! Great list! I also keep a change of clothes and tennis shoes in my room. You just never know when you are going to need them!